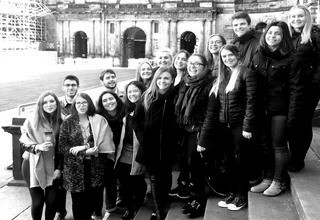 Thirteen students from Lithuania and Portugal visited the University of Edinburgh 24th – 28th of April 2017 to understand how social responsibility issues are prioritised and implemented, as part of ESSA’s first audit. The trained Student Auditors from Kaunas University of Technology and the University of Porto reviewed documentary evidence and interviewed staff and students over the one-week period. Nine host students from the University of Edinburgh provided essential support to the visiting Student Auditors during the week. The visit contributed towards students’ understanding of how the University’s work on social responsibility issues compared against the Benchmark Standards for University in Social Responsibility. At the end of the week, staff and students from the University of Edinburgh, attended a presentation made by the Student Auditors of the initial findings and recommendations for the University to improve its performance on some social responsibility issues. Student Auditors described the University as a ‘prime example in social responsibility and sustainability issues’ as well as being ‘able to adapt to new demands successfully’. A recording of the presentation and a detailed feedback report will be available in June 2017. The next audit will take place at Kaunas University of Technology, Lithuania, in October 2017, and will be performed by a new batch of trained Student Auditors from University of Edinburgh and University of Porto, with support from the host students based at Kaunas University of Technology. As part of ESSA, four audits will take place in total over the three years of the project.